Rich Fellers and Flexible on course in Thursday's $31,000 HITS Welcome Classic, presented by Pfizer Animal Health, at the HITS Desert Horse Park in Thermal, California. THERMAL, CA (February 11, 2011)—Rich Fellers won his third Grand Prix in a row at HITS Thermal when he rode Harry and Mollie Chapman's Flexible to the top prize in Thursday night's $31,000 HITS Welcome Classic, presented by Pfizer Animal Health, in the indoor arena at the HITS Desert Horse Park in Thermal, California. Fellers (Wilsonville, Oregon) has been on quite a roll as of late! 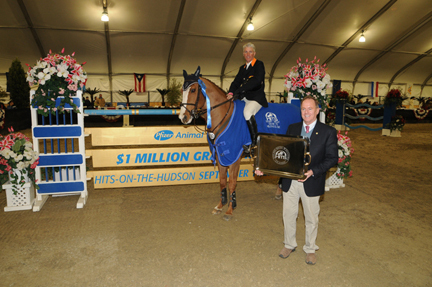 In addition to scoring the blue in Thursday's feature class, just last week he rode Flexible to the top of the class in the $50,000 Strongid C 2X Grand Prix, presented by Pfizer Animal Health, and piloted McGuiness to the crown in the $25,000 Smartpak Grand Prix, presented by Pfizer Animal Health, during Desert Circuit II. Last night, Fellers and Flexible were the best of the 40 horse-and-rider pairs that challenged course builder Florencio Hernandez' first-round track and the 14 pairs that advanced to the seven-obstacle jump-off. Hernandez' first-round featured 12 obstacles and 15 efforts, including a double and triple combination, as well as a liverpool in a time allowed of 71 seconds. Richard Spooner (Aqua Dulce, California) and Show Jumping Syndications' Cristallo wasted no time showing the field how it was done! They were first to show and made the successful journey around the track without dropping any rails. One trip later, Charlie Jayne (Elgin, Illinois) and The London Group's Athena, winners of last week’s $31,000 Welcome Classic, conquered Hernandez' first-round course to ensure there would be a jump-off. Two trips later, Eduardo Menezes (Carlsbad, California) riding his own Tomba went clear, followed by Fellers and Flexible, which was the start of a string of teams advancing to the jump-off. At the end of the first round, 14 pairs advanced to the jump-off including Karl Cook (Woodside, California) and Signe Otsby's Uno de Laubry, John Pearce (Bermuda Dunes, California) and Forest View Farm's Son of a Gun, John Perez (Cruz, Manca, Coajimaipa, Mexico) aboard his own La Cantara Utopia, Pearce and Forest View Farm's Chianto, Spooner and his second mount Billy Bianca, Meredith Michaels-Beerbaum (West lake Village, California) and Richard Michaels' Kismet 50, Menezes and his second mount Reflection Mercedez Benz, Mark Watring (Hidden Valley, California) and Horsework's Etc. Inc's Green Sleeps Vioco, Susan Hutchison (Temecula, California) and El Dorado 29's Cantano and John Anderson (Calgary, Alberta, Canada) and Foxdale Farm's Terrific. Once Hernandez and his crew adjusted the fences for the jump-off, spectators prepared for an all-out battle for first as an enthusiastic crowd filled the indoor arena, including a jovial Charles Owen VIP Club whose members had a front-row seat to all the action. The short course featured seven efforts, including a double-combination in a time allowed of 45 seconds as the horse race over fences was officially on! Kicking things off in the jump-off was the HITS Desert Circuit's all-time leading money winner, Richard Spooner, aboard Show Jumping Syndications' Cristallo. The horse-and-rider combination had an unlucky rail down midway through the course and finished with four faults in 32.79 seconds, resulting in a third-place finish. The runners up in last year’s Pfizer $1 Million Grand Prix were next to show when Charlie Jayne and The London Group's Athena entered the ring. A pair of rails down kept Jayne and Athena out of the winner’s circle and out of the ribbons this time around. Third to show in the jump-off was Menezes and Tomba. Their jump-off round failed to produce the night’s first double-clear round when the skinny at fence five came down after a light rub, resulting in four faults and a sixth-place outing. After the class, Menezes expressed how excited he is to be at HITS Thermal. "We are here all six weeks," he said. "My customers are thrilled to be here. I plan to show in the Grand Prix classes the rest of the circuit and do my best to qualify for the Pfizer Million." Rich Fellers and Flexible followed Menezes in the jump-off with a simple plan: They wanted to be fast and they wanted to be clean. It turned out to be a good plan as they got their wish when they jumped clear and set The Great American Time to Beat in 35.00 seconds, a pace that proved to be untouchable as the next 10 teams failed to take away the lead. "My horses are jumping great," said Fellers. "I really couldn't ask for anything more." Fifth to show in the jump-off was Karl Cook aboard Signe Otsby's Uno de Laubry. The up-and-coming rider and his partner took a shot at the leading time, jumping clean in 35.25 seconds; however, their time was off the pace and they ended the class in second place. Canadian Olympian John Pearce joined the jump-off party on his first of two rides when he entered the ring aboard Forest View Farm's Son of a Gun. Once again, the skinny jump was the culprit of a rail hitting the ground as the combination finished the class in the 12th spot. John Perez and La Cantera Utopia were up next in the jump-off. Perez, who is returning to the HITS Desert Circuit for the first time in a few years, had lots of praise for Thermal. "The place looks fantastic," said Perez. "I have not been here is a couple of years and the facility has really grown up." When it was time to get down to business on the short course, Perez and his nine-year-old mare also got tripped up at the skinny along the way, resulting in a four-fault effort as they finished in ninth place. "It was a tough jump," said Fellers. "The skinny rail was half the length and weight of a regular rail, so any little rub and it would come down. I was fortunate to get over that jump." Spooner returned on his second mount of the jump-off aboard Billy Bianca. They were fast and clean heading to the finish line but had heartbreak at the last jump resulting in four faults and a fifth-place finish. Meredith Michaels-Beerbaum and Richard Michaels' Kismet 50 were up next and had the first jump down on the short course for her only fault along the way and finished in 10th place. 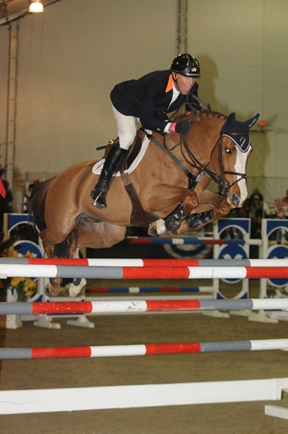 Pearce and Forest View Farm's Chianto were the ninth team to show in the jump-off. The talented duo that placed third in last year’s Pfizer Million also had the first rail down along the way and finished in eighth place. Menezes came back for the second time aboard his own Reflection Mercedez Benz. The pair also fell victim to the skinny jump and had to settle for fourth place. Mark Watring and Horsework's Etc. Inc's Green Sleeps Vioco were the first of three remaining rounds in the jump-off. An early rail down and another one down later in the course took them out of contention and out of the ribbons. Two very talented horse-and-rider pairs remained to challenge Fellers and Flexible. Susan Hutchison and El Dorado 29's Cantano had the first chance to upend the leader but dropped an early rail to land in seventh place. Sitting in the cat-bird's seat was Canadian John Anderson aboard Foxdale Farm's Terrific. The Olympian dropped an early rail and finished in 11th place as Fellers and Flexible proved to be too much for the competition once again! "My horse just keeps getting better and better," said Fellers. "I plan to show Flexible on Saturday night and McGuiness on Sunday. After that they get a week off and I expect them both to come back fresh and ready for the second half." Bobby Drennan congratulates Rich Fellers after winning the $31,000 HITS Welcome Classic, presented by Pfizer Animal Health. Action for the High-Performance riders at HITS Thermal continues on Saturday night with the $50,000 HITS CSI-W Grand Prix, presented by Pfizer Animal Health, for the second of this season’s four FEI World Cup Qualifiers. On Sunday, the $25,000 SmartPak Grand Prix, presented by Pfizer Animal Health, caps of Desert Circuit III as Grand Prix riders continue to shoot it out for a spot in the second-annual Pfizer Million.